This is a 'Teapot for Two'. 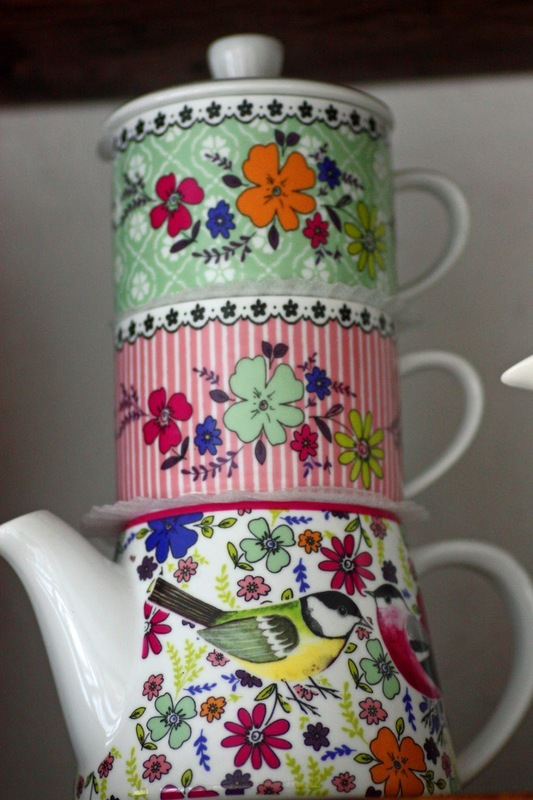 It compliments the 'Tea for One' Teapot I was given a few years back by a work colleague for my Birthday. 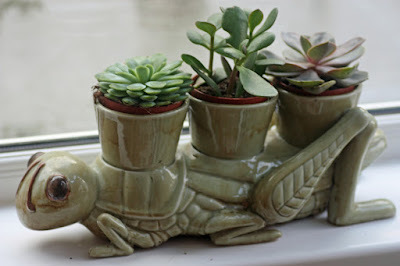 This grasshopper plant holder has featured on my blog before, but not with the succulent plants, that i picked up to put on the new window sill in the extended kitchen space. I have also featured this ceramic bird ornament with a tomato on its head. I am showing it off again because I love it so much, especially the various vegetables on its belly. We got it from Bruge in Belgium, now it has pride of place (see first photograph) where it can be enjoyed by all who see it. By the way, we have two new neighbours. One moved in a month ago, and the other early this week. One of our elderly neighbours passed away last year and the family put the house on the market and it sold pretty quickly. The other neighbours had gone overseas and rented their place out for over four years, they came back in March and put their place up for sale, it also sold within the week. So we have two new neighbours. The one new neighbour that moved in a couple of months ago has a dog and four chickens. She gave us some eggs which is my only food offering this month for In My Kitchen. Of course, I repayed the compliment and gave her some rhubarb and some courgettes. I am hoping the newest neighbour who moved in this week with her two dogs will be just as nice, but I am a little unsure about her. I am hoping to be wrong. 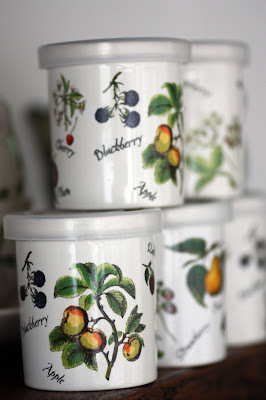 I am sharing this blog post with Sherry Pickings for In My Kitchen series, its one of my favourite blog events to participate in as it gives us all an opportunity to take a peek into fellow bloggers kitchen world wide. Thank you Laura. Yeah, I think we have acquired some grandparents who babysit the noisiest grandchidren, they are there at w/e and after work, the quite garden place I have no longer exists and if its not the kids and the barking dogs! Thanks for the warm wishes. Your chicken looks as if it is planning to try out to be in one of the Wallace and Grommet series. 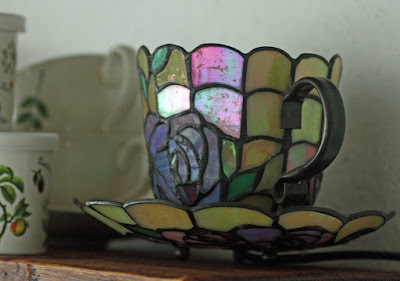 What a great object! You have definitely expanded into a very pretty space. This was a good use of that conservatory space. I enjoyed peeking into your kitchen...Hope the new neighbors are quiet. 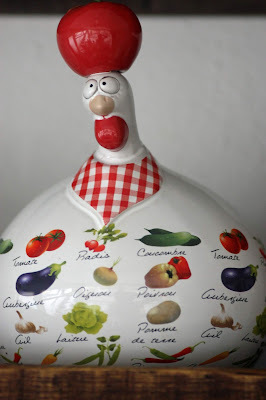 What a great IMK post, so much interesting kitchen paraphernalia to see - that hen with the tomato on its head looks quite dopey but in an amusing way. I love your tiffany teacup and teapot and I am quite impressed by your dispensers. And I really love that you have extended your kitchen - a conservatory sounds like a nice place to enjoy your kitchen - hope you have some nice views of your garden. And good luck with the neighbours! Thank you so so much Johanna. So pleased you enjoyed this post. I am trying to remain positive with the new neighbours. This space is gorgeous! All those beautiful things to cook with!!!! I love it! Thank you so much. What a lovely compliment. I am trying to remain positive about the newest neighbours. 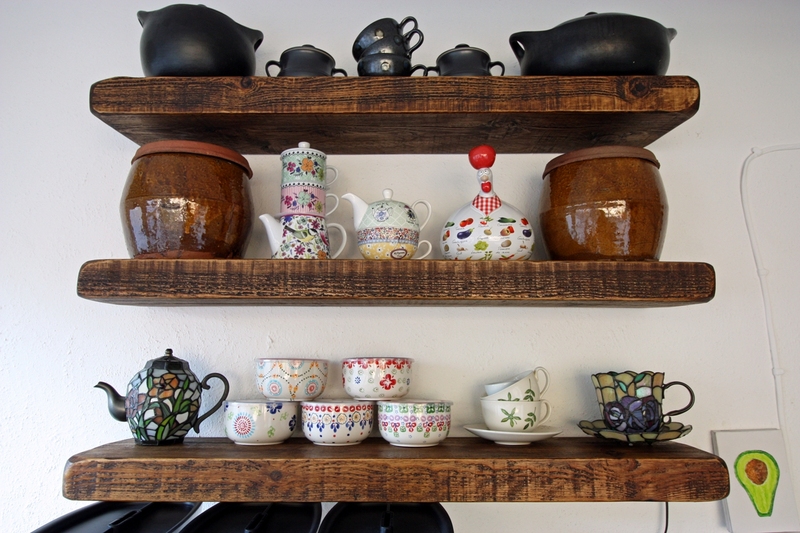 Lovely kitchen Shaheen and the shelves look awesome. Shaheen, what a visual treat! The light from your conservatory windows (and frosted window in the door) and neutral colored flooring and walls are a perfect complement to the rich wood and pops of color. How nice to be able to see your favorite kitchen things every day -- all within reach to use or enjoy. 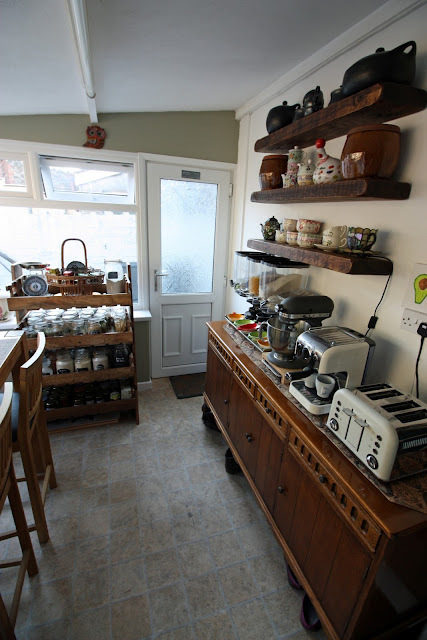 I simply love your kitchen extension! 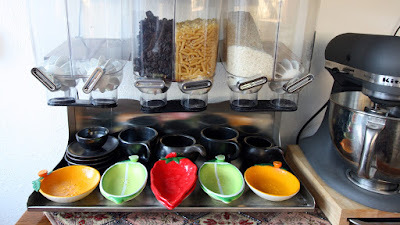 I love the shelves and your assorted items. You can never have too many shelves!